Jyotisha (or Jyotish from Sanskrit jyotiṣa, from jyótis- "light, heavenly body") is the traditional Hindu system of astronomy and astrology. 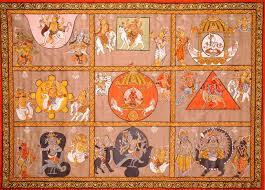 It is also known as Hindu astrology, Indian astrology, and more recently Vedic astrology. The term Hindu astrology has been in use as the English equivalent of Jyotiṣa since the early 19th century, whereasVedic astrology is a relatively recent term, entering common usage in the 1980s with self-help publications on Āyurveda or Yoga. The qualifier "Vedic" is however something of a misnomer, as there is no mention of Jyotiṣa in the Vedas, and historical documentation suggests horoscopic astrology in the Indian subcontinent was a Hellenic influence post-dating the Vedic period.Jyotiṣa is one of the Vedāṅga, the six auxiliary disciplines used to support Vedic rituals. :376 Early jyotiṣa is concerned with the preparation of a calendar to fix the date of sacrificial rituals.There are mentions of eclipse causing "demons" in the Atharvaveda and Chāndogya Upaniṣad, the Chāndogya mentioning Rāhu. :382 In fact the term graha, which is now taken to mean planet, originally meant demon.The Ṛgveda also mentions an eclipse causing demon, Svarbhānu, however the specific term of "graha" becomes applied to Svarbhānu in the later Mahābhārata and Rāmāyaṇa.The foundation of Hindu astrology is the notion of bandhu of the Vedas, (scriptures), which is the connection between the microcosm and the macrocosm. Practice relies primarily on the sidereal zodiac, which is different from the tropical zodiac used in Western (Hellenistic) astrology in that an ayanāṁśa adjustment is made for the gradual precession of the vernal equinox. Hindu astrology includes several nuanced sub-systems of interpretation and prediction with elements not found in Hellenistic astrology, such as its system of lunar mansions (Nakṣatra).